Ellie Wilk and Josiah Shultz were honorees at the recent Emerald Circle Banquet, in Manhattan. Two Frontier Extension District 4-Hers were recognized at the 31st Emerald Circle Banquet, held recently in Manhattan. A prestigious event of recognition and tribute, the banquet honors outstanding 4-H project and scholarship winners from across the state. 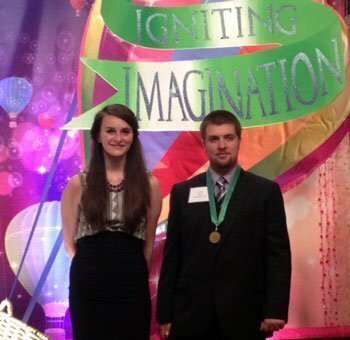 This year’s banquet’s theme was “Igniting Imaginations”. Ellie Wilk, past Willing Workers 4-H member, was awarded the John C. Carter Memorial Scholarship. A senior at Kansas State University, she is pursuing a B.S. in animal science and plans to enter veterinarian school after graduation. She is the daughter of Ken and Sally Wilk, Osage City. Josiah Shultz, current member of the Clover Wranglers 4-H Club, received the State Project Award for Photography, and was presented with the Emerald Circle medallion. He will be attending National 4-H Congress later this year in Atlanta, Ga. Josiah is the son of Brett and Gina Shultz, Burlingame. Information and photo thanks to Frontier Extension District.